A beautifully kept lawn can be the perfect centerpiece of an impressive garden. Their history dates back to England in the 17th century. Stately home owners would closely cut large expanses of grass, indicating their wealth. Thus showing that the owner was so incredibly rich they did not need the land for livestock or crops. Today, the lawn is less of a status symbol—perhaps being replaced by the car in your driveway or the state-of-the-art gadgets in your home. However, a well-cut lawn looks amazing and forms an easy-to-maintain area of your garden. If you’re not lucky enough to have acres upon acres of land, a ride-on mower would just be overkill—a regular push lawn mower would suffice. However, with the proliferation of models on the market, together with their different functions, choosing the right mower can seem to be harder work than cutting the grass itself. This article will take you through the best push lawn mowers available. In addition, it provides some key features to look for, helping you make the perfect decision. So, if you want to emulate the English Jacobean aristocracy, read on. As the name suggests, a push lawn mower is one which requires the user to physically push the mower around the grass. That’s unlike self-propelled versions which are powered. Hence, all the forward momentum comes from physical exertion, and not from the lawn mower itself. Generally, these push lawn mowers come in three different forms—manual, electric, and gas. These alternative types affect the way that the cutting blades are powered. In the case of the manual mower, the forward pushing action causes the blades to spin. The cutting process is powered by either electric or gas in the other versions. Yet, they still require the user to push the mower around the grassy area. Push Lawn Mowers—What Are the Benefits? Price—generally they’re cheaper than self-propelled models. Running costs—will use less fuel or electricity, or none at all if it’s manual. Easier to maintain—as they lack forward-drive mechanics, there is less to go wrong. Lighter—the absence of a powering mechanism reduces weight. Controllable—little chance of the mower “running-away” over your flower beds— or feet. 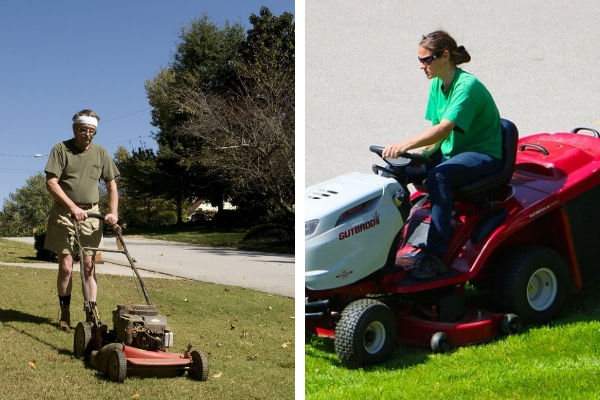 Better for the environment—if you choose a manual mower, there are no gas fumes. Exercise—pushing a lawn mower around your garden can provide a free workout without having to attend the gym. Less effort—if you’re lacking in the strength department, they make mowing easier. Covering large areas of ground—if you have more than 2000 square feet of lawn, a push mower may be inadequate. Speed—generally a self-propelling mower will cover the grassy area in a faster time—unless you’re Usain Bolt. It’s not a case of “one size fits all” when it comes to push lawn mowers. It depends on factors such as garden size, physical ability, and your particular lawn’s requirements. This is a choice between electric, gas, or manual. Simple and easy to use—you just plug it in and go. The electrically-powered blade means that the only energy you use is pushing the mower forwards. The issue with these mowers is that you do require access to a power outlet—which can involve lengthy extension cables. Naturally, this comes with a couple of safety issues. You could either trip over the cable or cut straight through it. These have the most powerful cutting blade of all the push mowers, making them ideal for thick or overgrown grass. The downside is that they are noisy, smelly, and require a trip to the gas station for fuel. Furthermore, they are the heaviest of all push lawn mowers, making them unsuitable for the physically challenged. Manual mowers are harder to push, as both the forward momentum and blade-cutting action are all provided by the user. Hence, for the middle- to large-sized garden, an electric or gas version may be better. However, it’s generally thought that these mowers provide a better cut. This is due to the cutting action which acts in a similar fashion to a pair of scissors. Conversely, most electric and gas versions rip and tear, leading to a less appealing aesthetic. Being able to adjust the blade height through a variety of positions allows you to create the perfect finish. From a lush stately home lawn to a tightly cropped golf putting green. The wider the blades, the faster you will cut your grass, as it requires fewer passes. However, bear in mind that with wider blades, both weight and resistance increases, meaning more effort on your part. As you cut the grass, the clippings have to go somewhere—either straight back onto the grass or into a bag. Leaving grass clippings on the lawn can provide benefits, including reducing the need for fertilizers. It also protects the growing grass during dry spells. However, if it is cut when too long, this can create a “thatching” effect and promotes grass diseases. If the mower does not have a collection bag, the lawn cuttings can then be raked. Although again, this requires more physical effort. The larger the engine, the more powerful the cutting action. This can make cutting easier and speedier. Although, a larger engine means a heavier lawn mower. Electric and gas push lawn mowers have two front and two rear wheels. Ideally, look for a machine with large back wheels and small front ones. This means easy cornering and maneuverability—making lawn edges tidier and preventing missed areas. 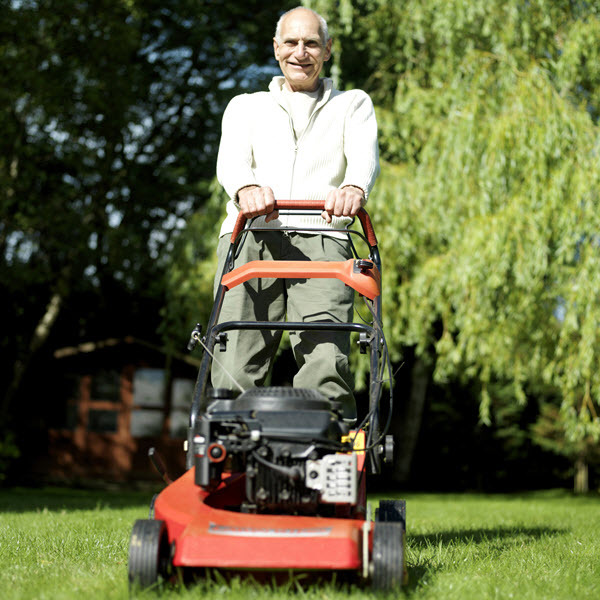 Pushing a lawn mower can place stress on the hands. Many mowers come with handles that are designed to reduce grip fatigue and increase comfort. Now you know what you should be looking for, here are our top five push lawn mowers. In addition to the features listed above, many of these mowers have benefits which are individual to particular models. Where this is the case, I’ve indicated as such. These mowers are listed in reverse order, so if you do want to know our number one pick, you can scroll straight down to the end. This is a gas-powered push mower with sleek and modern looks—making it ideal for those who want to make a statement. With a 132 cc engine, it’s not the most powerful of our best lawn mowers. However, it provides enough cutting action to power through medium- to semi-dense grass. The height of this mower can be adjusted through six different settings. This gives a wide variety of choice enabling you to trim your grass to your own individual preferences. If you have a larger lawn, this mower could be a good option. 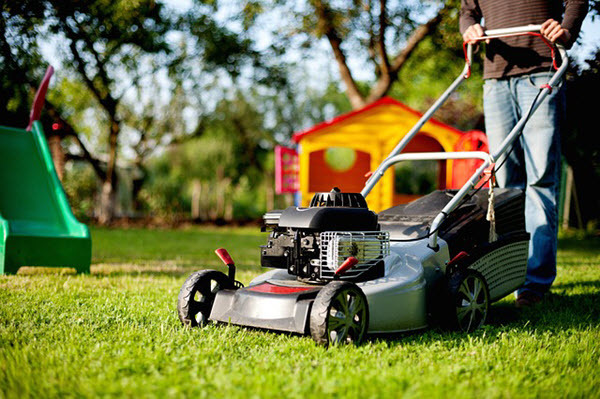 With an expansive 21-inch cutting area, fewer passes are required to complete tending your grass. That’s important if you’re pressed for time or see mowing the lawn as a chore. Cuttings are expelled from either the side or bottom of the mower. There is no bag included, nor is one available as an optional extra. The front and back wheels are seven inches and eight inches respectively. While good for going over uneven terrain, tight cornering could prove difficult. A nice bonus is that they have a heavy tread, meaning good ground holding and less likelihood of sliding. The cut-off handle includes a hand grip for added comfort and vibration reduction. This handle can be extended, depending on your height. A useful feature if you’re a tall person—allowing you to stand up straight and reducing pressure on your back. Gas engine starts simply and easily after a couple of primer pumps. At 62.8 pounds, it’s a lightweight gas mower—good for the strength-challenged. Tight cornering is difficult with the large front wheels. No bag cutting collection option. One of the more noisy gas mowers. 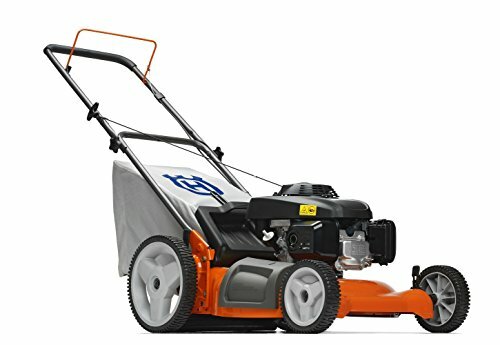 If you have a large garden that involves a lot of turns when cutting, this mower could be a good choice. It has an impressive front-to-back wheel ratio of seven inches to 11 inches—making cornering and turning easy. This provides a sure cut with no misses. If the design is important, this wheel ratio, combined with the striking red color makes it look like a race car. Sticking with the race car theme, the wheels are slicker than wet weather tires. While there is a little tread, cutting damp or uneven ground could prove to be an issue. The reliable and proven MTD 140cc gas engine will handle most stubborn and thick grass densities. This will allow you to push on through without the annoyance of having to make a second pass. Furthermore, it has a 21-inch blade, reducing the cutting time and allowing you to get that well-deserved coffee break much sooner. This push lawn mower can be raised or lowered through six different height settings. Each front wheel is adjusted through its own lever, enabling you to customize your mower to the terrain of your lawn. While this mower does not have a bag-collection system, there are a nice couple of alternative features. Cuttings can either be discharged from the sides or mulched, providing a nice fertilizer base if the grass is not too long. Although the handle height can be adjusted for comfort, the engine cut-off bar has no additional cushioning or grip. As this bar is relatively thin, extensive use could prove to be uncomfortable on the fingers and hands, which can lead to fatigue. This mower comes with a two-year warranty and weighs 62.8 pounds. Large front/rear wheel ratio for easy cornering in difficult areas. Dual-level adjustable cutting height makes it ideal for uneven terrains. A side deposit or mulching feature, depending on requirements. Easy setup, with comprehensive instructions. Large 21-inch cutting blade means fewer cutting passes. Lack of cushioning on the cut-off bar. Although strong, the thin handles give it a fragile feel. While manual push lawn mowers may hark back to yesteryear, this mower has clearly been designed for the 21st Century. An orange blade casing, together with quirky angled handlebars makes this mower perfect for those who want to combine tradition with modernity. Although the cut is true and close to the ground, there is no option to change the height settings. Hence, if you are someone who likes to select your own cutting level, it may not be a great choice. However, despite being a manual mower, it has serious power. It includes an inertia drive system, which amplifies the cutting strength of the reel blades by up to 75 percent. This means that normal cutting is easy. However, should there be any twigs and leaves on your lawn, it should still push through without clogging or jamming. 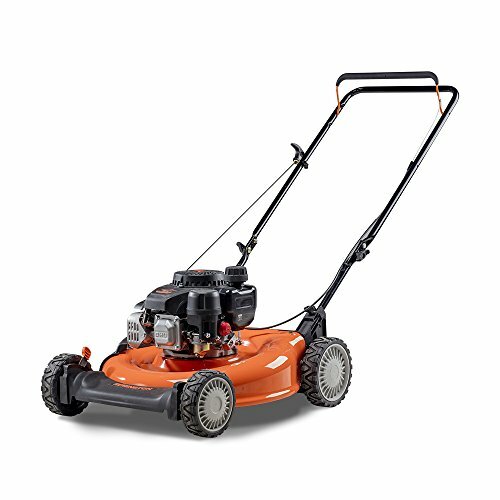 The 17-inch cutting blades are smaller than most gas or electric versions, although larger than many manual lawn mowers. For a small to medium garden, this would cover the area adequately. There is no collection system, which isn’t a surprise. They are rare on these types of lawn mowers. Yet, this push mower expels the cuttings forward, meaning that your feet don’t have to catch all the debris. Unusually for a manual push lawn mower, it has four wheels. The smaller rear pair allows you to tip-and-pivot, enabling fast and easy cornering. It also makes the mower stable, allowing you to leave it standing upright while you take a break. The handles include a well-cushioned hand grip for comfortable use, although the handle length is not adjustable. It’s perfectly suited to anyone up to a height of around six-feet-five inches, without any requirement to bend. Modern, fresh design, combined with a traditional approach. Inertia drive to improve cutting power and reduce effort. Hardened steel blades cut grass without scraping the floor, meaning less sharpening requirement. Heavily cushioned handles for comfortable use. Does not provide the most even of cuts—often requires a second pass. If you want some serious strength in your push lawn mower, then this could be the model for you. 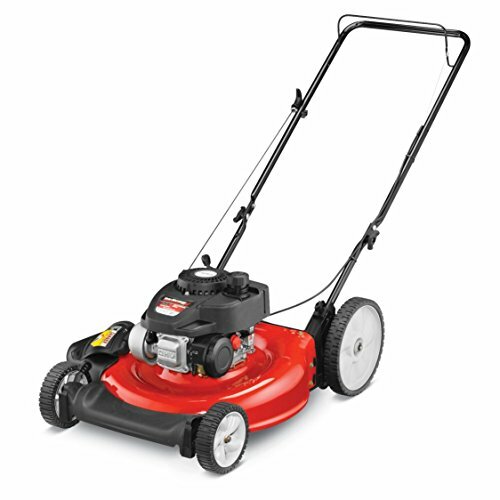 Having an incredibly powerful 160cc gas Honda engine, this mower will push through the toughest of grass. This makes it a good choice if you often let your grass grow long or your lawn is surrounded by trees which shed twigs. The nine different height levels mean that even if your lawn is overgrown, the blades can be raised to cope. Furthermore, each individual corner of the mower can be raised or lowered. This gives you the perfect position for any lawn surface, however uneven. Unlike some models, the wheels do not work on a basic pin mechanism—they include a set of double ball-bearings. This means that every push is smooth, easy, and reduces wear on the wheels themselves. 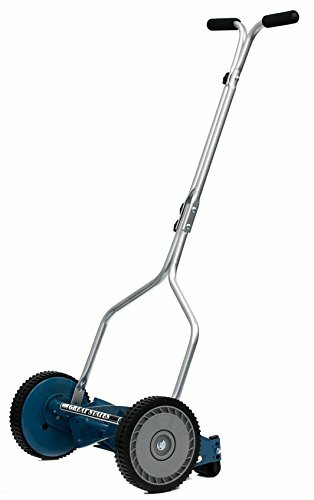 The 21-inch blade combined with the large engine capacity makes this a good choice for people with larger gardens. That is, those who need power together with size. When it comes to the cuttings themselves, this mower provides versatility. There are three different options to choose from—mulch, side expelling, or bag collection. So, whether you want to leave your grass to fertilize the soil, or collect for a clean appearance, this machine can deliver. Steering this push lawn mower is simple, with its 12-inch oversized rear wheels and eight-inch wheels on the front. A height-adjustable soft-grip handle means wielding this beast is not an unpleasant experience. Even with a large engine, this mower only weighs 65 pounds, making it one of the lightest in its class. Space is always an issue in my garage, but this mower fits the bill. The handles fold down for easy storage or for placing in the back of your car. Large 160cc Honda engine for serious cutting power. Lightweight for a machine in this class. Choice of three different types of cutting collection and spreading. Four points of adjustment for the perfect height setting. Easy-pull start system for people lacking strength. Smooth ride over even on tough terrain, preventing fatigue. The lower height settings make the mower scrape the ground—even on slightly uneven surfaces. A small collection bag requires frequent emptying. While the above mowers are good products, when it comes to the best, it has to be the most traditional. This mower cuts everything back to basics—no frills or over complication, just a seriously useful and practical manual mower. Looking at the machine, it has retro written all over it—exposed cutting blades, two-wheel design and vintage blue paintwork. Only the shiny steel handles indicate that this is a modern product. The cutting height can be adjusted from 0.5 inches through to 1.5 inches—a nice feature not normally seen on manual reel mowers. The 14-inch blade is a good option for the small to medium garden. Although, if your lawn is a little larger, there is an 18-inch version available. This compact blade size, together with narrow handlebars, means it is ideal as a space-saver. The grass is expelled from the front of the machine, with rear rollers allowing for a smooth and lined finish to your cut. 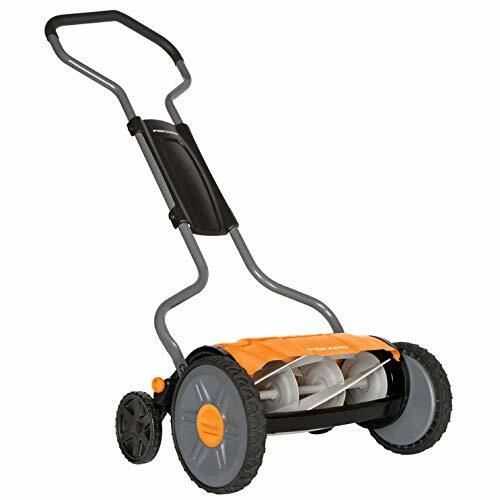 The 8.5-inch wheels are thickly treaded, providing good purchase on your lawn and no sliding. Made out of heavy-duty polymer, they will last through damp conditions and will not perish, unlike some rubber wheels. The twin handles, common in vintage machines, are thickly padded—providing comfort and easy maneuverability. Perhaps the only downside I can find with this machine is that they are not height adjustable—one size for all. As opposed to rotary mowers, this reel machine snips away at the grass, leaving tight cuts with no fibrous residue. These clean cuts mean less likelihood of disease and a healthier, greener lawn. With a weight of just 19.9 pounds, it is extremely lightweight. This would make it a good option for both the strength-challenged and for seniors. Also, if you have older children, there is no reason that you cannot send them out into the garden to cut the lawn for you. It’s light enough even for them. A traditional-looking push lawn mower made with modern materials. Lightweight, making it ideal for seniors, transportation, or hanging on the garage wall. Good gripping and perish-resistant wheels. Comfortable to use and easy to maneuver. Handlebars are not height adjustable—this may make them awkward for taller people. When you’re choosing your push lawn mower, you’re looking for a machine that can give a perfect finish. That is while reducing the cost, hassle, and maintenance of self-propelling models. In my opinion, the Great States Hand Reel delivers on all these counts. With its scissor cutting action, each trim is clean and sharp, giving your lawn that putting-green finish. Plus, less likelihood of disease means you will not be treating or fertilizing your grass as often. Lightweight, portable, and easy-to-maneuver, it’s a mower that can be used by all ages and abilities. No cables to cut through, spark plugs to change, or gas to be filled. Furthermore, it has a great retro appeal. That’s why it’s our top pick.